Sticking with darkera, nightera is just garish. Gave it another shot, appreciate the bugfixes but I gotta switch back to Legacy. This just isnt working for me, cool start but not ready for prime time. Going to hold out for something more like Oluasc created in this post, and with wider margins and less stuff hovering over my screen. NightEra still looks really harsh imo... DarkEra is perfect in regard to colours. Plus, NightEra leaves a lot of wasted space down the sides. Is that intended? May have been reported but the theme picker at the bottom has an underscore in the text, and the tooltip just says 'theme_chooser'. NightEra is still the same super saturated color. There's still too much contrast with the text vs background, and this is a lot more apparent if you're using a desktop at night and have nothing like f.lux. The text is still too bright! Took a while for NightEra to update for me, as at first it was that same harsh neon blueish purple color, but the new colors have kicked in now and it looks a lot better. I think I'll stick with this one. Thanks! Here's another vote for killing the gradients everywhere and turning down the saturation on the purple color in NightEra. I concur. It's just a bit too intense. Please take inspiration from the new mobile GAF. It is laid out so well. DarkEra’s color scheme is great but it doesn’t maximize the potential of mobile browsing. NightEra hurts my eyes and has too much space between posts, in addition to having unwieldy navigation buttons. Getting all that server prep done with so little downtown and with a fair amount of time left before E3 is seriously impressive. Is it just my phone, or does clicking the little arrow on a quote not take you to the original post as it would on a desktop browser? I even zoomed in and clicked...nothing happens. Firefox on a Galaxy S9+. So the only thing I did was go to DarkERA, hit f12, and copy some of the RGB codes. I feel like you can keep the gradient, but change the colors to these rgb(55, 34, 101) and rgb(86, 65, 132) (the two purples I found on DarkERA) and end up with a pretty good look. Edit: Also, you could probably change the width of the content to 94%. It won't overlap with the scroll bar that way, but gets rid of the white space. I know the white space may be there to allow for more ads in the long run (I could be wrong), but it really hurts the site content's ease of use. Color is better now. I'd probably still call it a bit of an eyesore though. Width is bad, but you're on that. Ultimately though, I'll stick with DarkEra so long as the navigation on NightEra remains as is: I do not like clicking thread title to take me to last unread. I do not like page count being obscured. I do not like the rewind/fast-forward buttons. It makes much more sense to me that title takes me to the title, namely the OP, that a bookmark takes me to where I stopped reading, and hitting a page, say, the last page, takes me there. 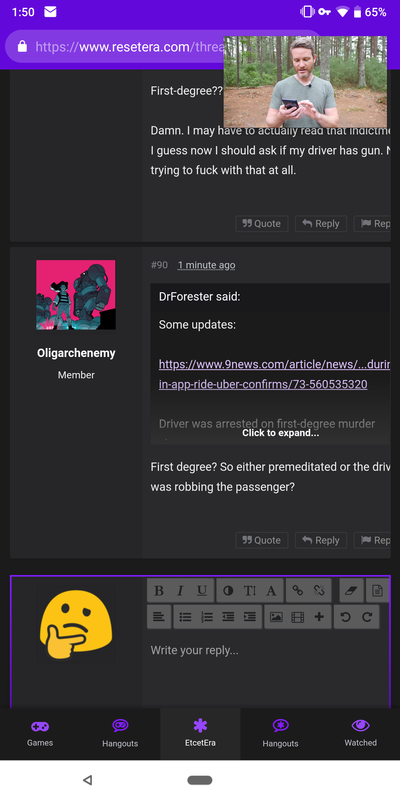 Sorry, the NightEra colors are still too harsh for me, and the gradient is distracting without adding anything to the visual identity of the site or aiding in navigation. Back to DarkEra legacy for me. I wish I could be constructive and offer helpful criticism, but I really do hate just about everything about NightEra, from the nav to the colors to the margins to the text, etc. I like nightera. I think it needs some color tweaks but it's good overall. I really appreciate all the work being put in, add don't want to sound ungrateful, but I do find the Night the to be incredibly grating on the eyes. Also, does anyone else have issues on mobile (Android chrome) where they can't autocorrect text after it's been writen? NightEra still has far too white of text. The contrast is killer in a bad way. Looking at the topic list, the links are so bright against the darker background. Yeah layout is still busted with quotes. Tried NightEra and immediately switched back because of the colors and tonal contrast. Trying to use it for several minutes was literally causing uncomfortable eye strain. It's too bad because a lot of the functionality and optimizations under the hood are great, and the only thing keeping me from switching are some RGB values. The colors and contrast of DarkEra work well, I don't understand the continued insistence on throwing them out the window. Maybe whoever's doing the color picking has an uncalibrated monitor with weird colors or nonstandard backlighting? NightEra still hurts my eyes. I honestly don't understand why the color palette was changed from darkEra at all. 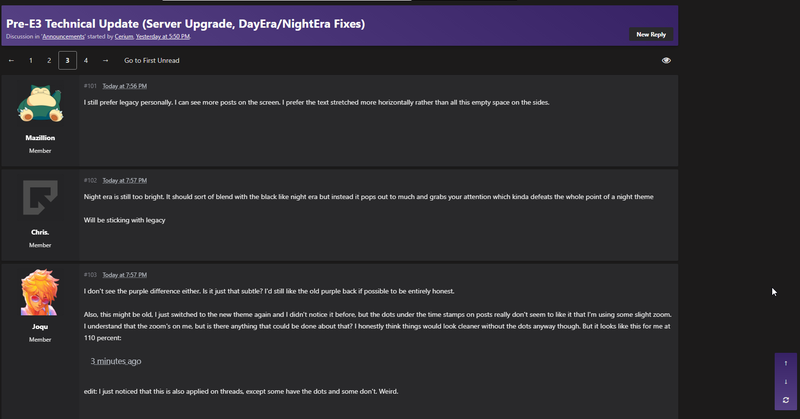 Sorry to say this but dayera and nightera are really ugly, the legacy themes are perfect just need a text size option. I dont understand why it has to be such a drastic change from DarkEra. It seems like a lot of people like the general vibe of DarkEra, but NightEra wants to try to change basically every single thing. Why? Why borders around avatars so that transparent ones are still squared off? Why such major contrast between the background and the fonts? Why massive margins around the avatars AND the whole site? Why floating buttons to go to the top and bottom when scroll bars already exist? Why constantly show the menu at the top taking up screen real estate 100% of the time? Why big buttons to go to the first and last page when other more simple solutions exist? Why basically ZERO feedback in the last thread, zero polls, zero replies, zero discussion, zero interaction? After the disaster of Night&DayERA you'd think they would have learned to consult the community. A single screenshot of the skins in development could have prevented so many bad decisions. Seems like the cycle is going to continue though..
Or dont involve us at all. Right now stuff is being shown to us, and we are made to believe that we part of this process, but with such a severe lack of discussion on there end, why both. I have issues with NightEra, and since it seems like they are looking for our input then I try to be vocal about changes I think need to be made And since they give me the choice, I switch back to DarkEra (which has its own issues) and wait and see if NightEra will be improved. But they could just remove the choice, remove the "discussion" and just force us to use the new stuff. People would complain, but we would get used to it. Right now we have this bad middle ground, of being asked for input, but then not interacting with us along the way. This looks really great. I'm not a huge fan of the gradient, but these colours make it look a lot better at least. I will say that I appreciate the work you all have done to update the colours so far. Especially the quote boxes not being pure black any longer and are now a dark grey. I'd still love to see the purple become a bit more muted, but it's an improvement, so thank you! Still getting mobile version on desktop... ugh. Same... for me this is a high impact problem... really needs to be fixed asap if they want people to use this theme. It's still impossible to tell at a quick glance. The legacy version is literally perfect. Bolded text vs normal text? Impossible to see. No highlight at all to show your own threads? Welp. Forum filling the screen no matter the size? Very good. huge amounts of empty space with nothing on the left and right sides? Terrible. The colors are still way too harsh. I still don't get why this needed to be changed at all. All of these changes are simply bad. Sorry for the blunt tone but I don't think there's a point in dancing around it with careful language. These are things that need to be fixed. The current changes aren't enough. This literally is a perfect case of the old stuff being straight up better. The Neon purple has to go. It's ugly and doesn't work at all. Yeah I vastly prefer DarkERA's milder colors. NightERA's ultra saturated purple is eye-blazing and the theme is far too contrasty in general. Also that floating tool that appears in the bottom right of my phone screen when I scroll through threads interferes with my reading experience. I want to be able to toggle it off permanently. Still having a problem with NightEra where when I refresh the page using the floating tool on the bottom right, the page will not refresh where I'm currently at like it does on DarkERA (Legacy). Often times I refresh to look for new comments and if I came to the thread via one of the links, that's where it will always refresh from. I posted about this in the other thread, would love to use this new style but this is a pretty big issue for me atm. Thanks for all the work you guys are doing to keep the place running like it is. Legacy DarkERA is where it's at. Less wasted area, no floaty button thing that only ever gets in the way, better readability, less offensive colours. Instead of all these newfangled whatchamacallits I'd rather have more polish. And I'm still unsatisfied with the twitter and youtube integration. Works 80% of the time, half the time. Oh well. This became a rant. Sorry 'bout that. Thanks for the hard work, and I'll cheer for you guys from the sidelines. It's appreciated, even when I'm rambling like this. Heyyy now I can finally have Era in portrait on my iPad without having to zoom out every time. Great work. (I’m fine with the night era colors). "In response to the most common point of criticism, the colors on NightEra have been adjusted for more comfortable viewing"
Are you 100% sure this update went through? The NightEra purple clashes so badly with the grays, I don't know if you could find a less comfortable shade of purple. I also don't understand why you've made avatar integration so restrictive with the new themes. You've enabled vertical avatar support on the legacy themes after the site's launch, but now we're once again forced to make square avatars; and with the added border, we're basically urged not to use transparency. I still think that NightERA has too bright/saturated colors, specially on mobile where it's really distracting. Why not just have a color/brightness option and then people can tweak to their hearts desire? We're getting better, perhaps, but NightERA is still not perfect. I like some of the quality of life stuff like having easy access to the Watched Threads button, and it definitely looks slick, but the colors are still a little too harsh for me. Also not a fan of obscuring the different pages of a thread of of all the VERY BOLD TEXT that's used for thread lists. It's distracting and doesn't feel good on the eyes. I tried using NightERA for most of today but I'm switching back to DarkERA for now; will give it another go next update. I'll definitely echo this. Era was founded on community. Please don't let that openness go away. A poll or two about UI / theme stuff would be a huge positive step. We had one about fonts a long time ago. The 'click to expand' quote section covers up the navigation buttons on mobile. If we could set one theme as our mobile theme and another as desktop that would be ideal. NightEra is not nearly as functional compared to DarkEra on desktop (Due to everything mentioned a few posts up by RaySpencer). Find it strange that avatar dimensions were quickly changed when the site was new so people could use more rectangular avatars only to have them go back to being square with the new themes. Also, that border around transparent avatars is just bad.